The Nazgûl: The Tainted. (Jewel of July ’18) | Azazel's Bitz Box. This entry was posted in Lord of the Rings, Mordor and tagged Citadel Nazgul, Lord of the Rings, LotR SBG, Nazgûl, Ringwraith, The Tainted. Bookmark the permalink. Very nice! 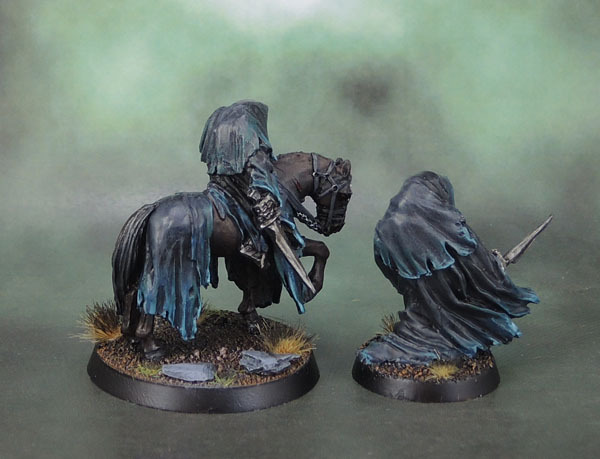 Fits in with your other Nazgul but subtley different! Very, very nice and I like the blue highlights on the black, great stuff! Thank you! It has turned out quite blue, hasn’t it? In reality I started with Vallejo Periscopes (dark seagreen) and then highlighted with periscopes with dark green, then added white for the last highlights. Well whether it was by design or otherwise the contrast is terrific to my eye and with black being the dominant colour the highlight has added to the visual appeal. As I said before, great stuff! I was actually just thinking that I would have gone more green than blue on the highlights, and it sounds like you did, but the camera messed with it. Interesting. Yeah. Probably auto-(over) correction on the part of the white balance due to the green background. If it gets finished and is put on display, even if it doesn’t get played, it’s far better than sitting unfinished in a drawer. Lovely work. I always enjoy seeing Tolkien stuff in miniature. Absolutely true on that! I’ve got a bit more Tolkien to come, and also some Star Wars. I’ve really ended up on a tangent when I really wanted to get some 40k models done this month! Great man. I really need to try that blue highlight thing. Just make sure to use green paint and you’ll be golden! Nicely done mate, he’s come out all sinister like! Thanks Alex, once again it’s a nice sculpt by the Perrys. Great work on that highlighting. Will pick up the paint you mentioned. Ah yeah, Periscopes is a great one that I only discovered last year when someone on Dakka mentioned they were using it to edge their Deathwatch. Nice highlighting, I was going to immediately ask “what blue did you use?”, but then I read that it was a camera effect. It looks amazing contrasted with the black, and I’m sure the more greenish color looks impressive in person too. I also really like the hunched over pose of the model on the horse. That was a powerful scene in the movie, so I can see why they would want to capitalize on it. Making me wish the little was old enough right now, and I would pop the movie in. Instead she’s playing ‘feeding Daddy coffee’ while he is trying to laptop…so gotta go…! Great work, truly another jewel! Yeah, it’s very close. You could get the blue that the photos show by using Periscopes as the base, then (I reckon) Citadel’s Baharroth Blue and then finally a touch of white. It’s not a major shift as the actual colour is *just* on the green side of the blue-green spectrum where the teals and turquoises live as the photo version is *just* on the blue side.. 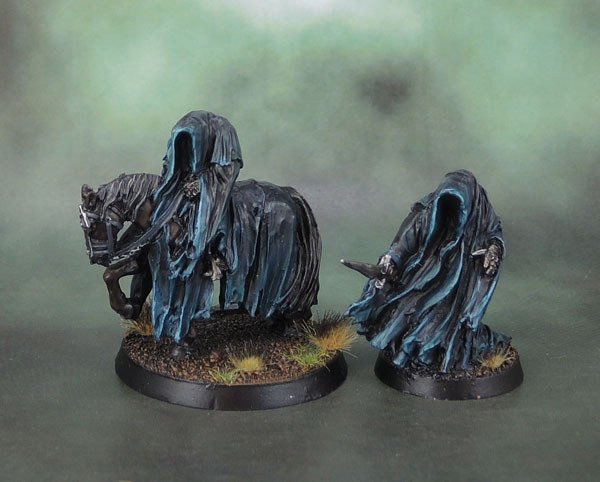 I agree that this is easily one of the better models amongst the “bonus Ringwraiths”. Luckily there are only a couple of truly dodgy ones amongst them! Not familiar with either of those paints, but that’s nothing new. Slowly I’ll hopefully be able to identify most of the Citadel line. Thanks for the tips! Yea, WordPress Reader on my iPhone is my go to normally. Go figure. Unfortunately I can’t view most people’s pics, so I have to wait for laptop time to reply on any new posts. Whoops! Periscopes is a Vellejo Model Colour Panzer Aces paint. Odd with the iPhone app – I use the WordPress app on my android phone sometimes, and have no problem viewing pics, though I don’t do anything but view, like and the odd comment with it. Ah, Panzer Aces, that’s why I hadn’t come across it before. I don’t have many paints from that line. Yea, not sure why some sites I can see the images and some I don’t. I just browsed though a bunch, yours appeared fine. But I would swear there were times I couldn’t see images on yours. I couldn’t see the images on Convert or Die, and another one, which was blogspot. Maybe image size has something to do with it? Yeah, I only have a relative few Panzer Aces, and I had to seek out Periscopes. No idea on the phone thing. Whatever the highlights, they damn well work! Makes me want to crawl under some roots too! Nice Azazel! Thanks Mark. He’s certainly a sinister looking one. Pingback: Sauron the Necromancer of Dol Guldur (Jewel of July ’18) | Azazel's Bitz Box. 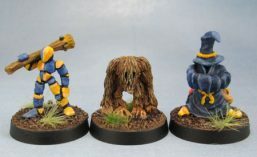 Pingback: The Mouth of Sauron (Foot & Mounted) – Technical August | Azazel's Bitz Box.